Lovecraft had only one recurring character, Randolph Carter, and his shorter stories are collected here along with a handful of “mythos roots” tales, which feature early mentions of the Necronomicon, Abdul Alhazed and Nyarlathotep. The Festival (and Other Abnormalities). 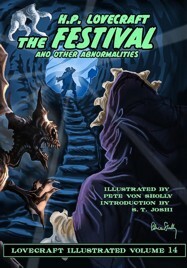 By H. P. Lovecraft, illustrated by Pete Von Sholly, introduction by S.T. Joshi. Hornsea, England: PS Publishing; 2017; ISBN 978-1-786360-96-0; jacketed hardcover. This book may be purchased in hardcover from Amazon.com or Barnes & Noble or directly from the publisher, PS Publishing.